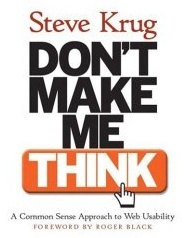 Title of the book doesn't mean that you should assume your users are stupid, just that what you provide them should be self-evident as should any actions they can take. Making a user think exists in the large as well as in the small. For the former, providing a confusing and changing layout will force the user to think about every single action she takes. For the latter, using nonstandard terminology for standard actions makes her think just a half second -- for instance, using 'Quick Find' instead of 'Search'. Consistency is key. For instance, if a user clicks on a link for a resident that says 'Robert Rodriguez' and gets to a page titled 'Resident Actions' with only summary information about the resident in a small red bar at the top, we're making her think. People don't read instructions, so don't even provide them. Cut your text in half, then cut it in half again. People muddle through without reasoning a rational explanation of what they're doing or why it's progressing the way it is. People rarely (approaching never) use the paths through your site that you expect, and you need to design it such that someone can look at a page and figure out what it's for, what they can do with it, and how to get around the rest of the site. Make 'clickable things' obviously clickable; creating a design for subtlety won't work, unless (maybe) you're designing a site whose sole audience is graphic designers. Krug's second law of usability: "It doesn't matter how many times I have to click, as long as each click is a mindless, unambiguous choice." Testing is crucial and is valuable even in small doses, even if you only do a little of it. Focus groups are okay, but a one-on-one videotaped encounter with a user trying to get certain tasks done with your site is best. He has a script of how such an encounter might progress. Before-and-after examples are really useful, where he takes a site's page, explains what's wrong with it and then creates a new page in response. Focus is on e-commerce sites circa 2000, which means a lot of current technology (like AJAX) doesn't come into play. It also means you there's a good amount of text that doesn't translate well to an internal application built for a dedicated (work-time) audience. For instance, the chapter on what goes into the home page is mostly irrelevant. I just noticed while digging up the link for this post that a second edition was published last year: doh! I don't know how much it's changed.